Some times when I try to make mayo it doesn´t work. So I tried to find out what I was doing wrong. People are doing this in a food processor in one minute, but mine never ended like a mayo when I tried that… I will keep trying. But when I whisk it by hand it usually works well. I found out that the yolk and the oil must be at room temperature. You can speed the process by putting the egg in a warm water, if you are grabbing them straight from the fridge. I never thought of that until I read it some where…thank god for smart people and the internet! Now you need a whisk and a strong arm. It´s hard to whisk by hand for few minutes, so have someone with you to take turns. 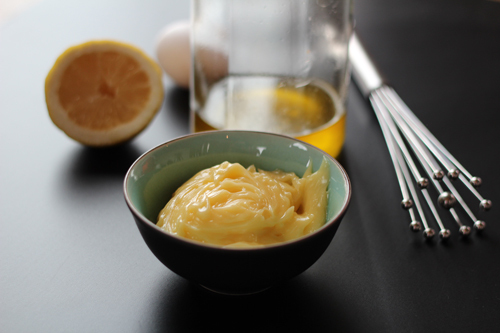 Mix up the yolk, salt and lemon juice. Pour the oil VEEERY slowly, drops only. Then when you get it thick enough, looking like a mayo, you can pour the oil faster, until you have the consistence you like. You can use any kind of oil, veggie oil, olive oil, peanut oil. Extra virgin has more flavor, but I kind of like that. Spice it up as you like, with Dijon or garlic for example. (By mixing it in with the yolk). 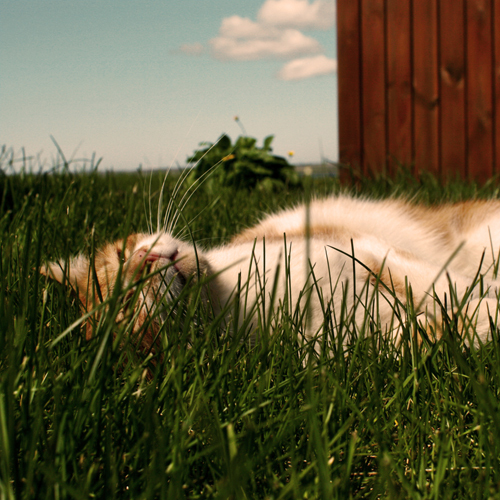 One of my neighbor in the country was enjoying the good weather last summer. I wouldn´t mind a vacation to a warm place right now. If you are into reading food blogs or are a food blogger you might have noticed all the great food blogs with awesome photos, a truly well composed and uber stylish. That is a full time job my friend. I can tell you that when I make a little effort into taking a little bit nicer photo it takes time and usually I have people sitting down and waiting to eat when I start this photo shooting nonsense. I don´t want to keep people waiting or eat my food cold so usually my photos are just a snap shot. Like the one below. It was an awesome dish and the photo could be more stylish, I knooooow. I could have sprayed some hair spray over it to make more shiny….but I didn´t because I was so eager to try this dish of mine. I do make food and eat it, I don´t cook for photo shoots. BUT…I came a cross a blog about food photography and styling and they have all kind of trick about making food look good. And there I saw that sometimes what you see is not what you think it is, like they have a trick for the never melting ice cream, hmmm, ice cream that never melts…. exactly, it´s not an ice cream but it sure does look like one tasty bowl of vanilla ice. Since this hobby of mine is about cooking and eating I will relax on the shooting, believe me…it´s a pressure out there to have nice shots. I can´t take the pressure…joke… I will make my best but I will also be eating after I shoot, a WARM meal. 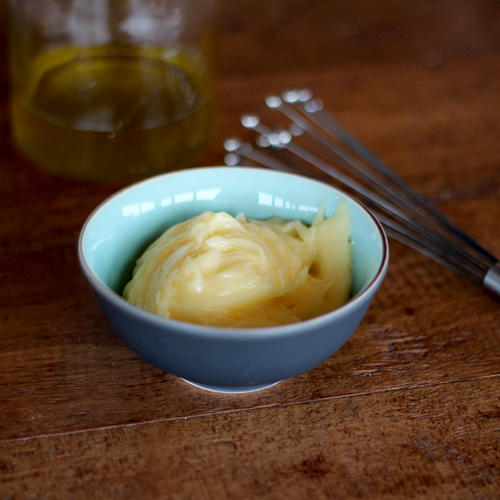 My melted Ice cream, I have a lot to learn about food photography …just kidding. This is a chocolate Ganache, but now I am learning. I could use this picture for a delicious brown sauce with meat balls or maybe Black bean soup or melted chocolate ice cream. (smiley). We did have some food in the kitchen the other day, little bit of this, little of that…but nothing was planned for dinner. In stead of buying what we thought we might need we cooked from what we had. That is always so much fun. I made one dish and my boyfriend one, first me then him. We call it Foodwaves when we cook like this. We made a huge concept about Foodwaves with Manifesto and all. I will tell you all about Foodwaves next time. Organic chicken stock, a dash. 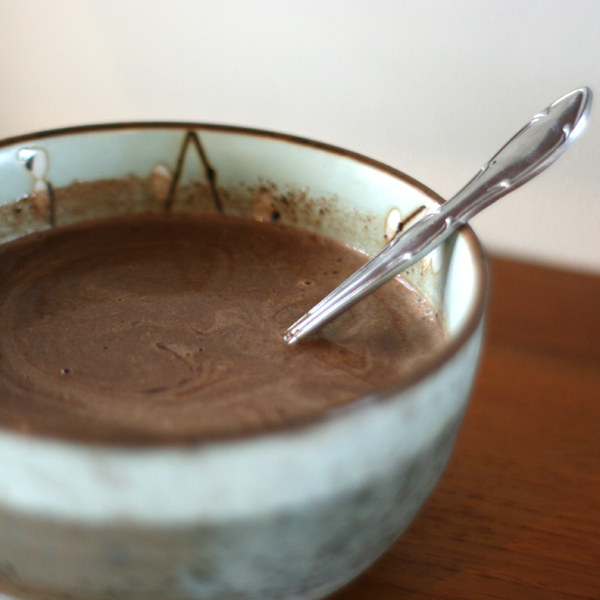 I didn´t mesure any ingredients, just made it by feeling. I will try to be as accurate in the recipe as I can, but with those ingredients it´s hard to make something bad. Slice up fennel, use half of it now and half later. Dice the cucumber. Mix well and set a side. This is the fresh salad under the scallops, a mixture of cucumber and fresh fennel. Fry the rest of the fennel with garlic and then add lemon juice and a little bit of fresh good orange juice and chicken stock. Salt and pepper. Little bit of cream and fresh basil. On a skillet with little bit of olive oil, fry the scallops. Before frying make sure they are patted dry and sprinkle with salt and pepper. You only need to cook the scallops for couple of minutes, about one – two minutes each side. Be sure it´s warm all the way trough, but don´t over cook it. 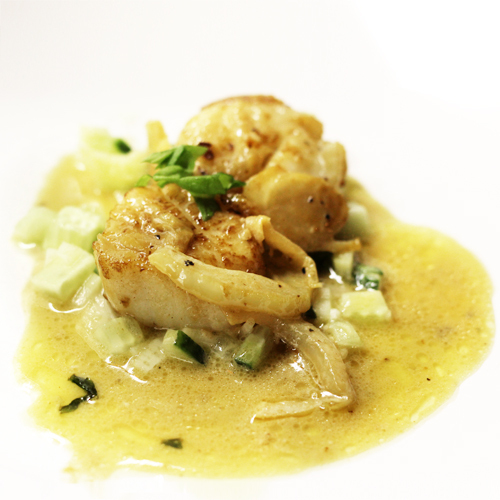 Put the salad on the plate, then the scallops on top and pour over the fennel cream sauce. Garnish with fresh basil. Serve right a way. With only 2 scallops each this is just a tiny starter. My boyfriend was very happy after the meal the other night and the two meals before that as well. Since I got advise on what to cook I am a big hit in the kitchen….not that I didn´t make nice food, but making something new and try new flavors has been a big hit. The recipe i made tonight wasn´t complicated and no ingredients i haven´t used before, but the combination and the simplicity was something I haven´t done before. A BIG HIT I tell you. Here is the recipe I got in one of the comments, this one is from a gourmet lady from Iceland. 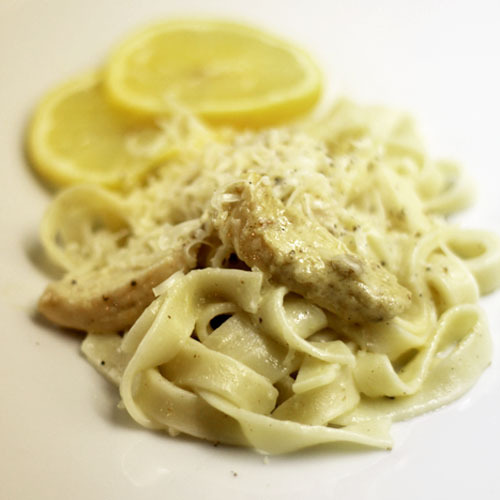 “Lemon chicken – a delicious recipe. Cut each into two pieces, on the thicker side, i.e. thinning each. That leaves you with 4-8 pieces which you coat with flour or spelt, liberally seasoned with black pepper. Fry the chicken breasts in a mixture of olive oil and vegetable oil and put in a baking dish to keep in oven for about 20 minutes at 180 degrees. Due to the thinness of the slices they don’t need long. DO NOT DISCARD THE OIL AND FLOUR! in your pan. 250 ml. cream, full fat or other according to taste. Pour the thickened sauce over chicken and boil some tagliatelle. The weekend was packed with dinner parties and sleepovers in the country. We had a lovely drive around the countryside. We went through Þingvellir, where Parliament was established in the year 930. Pizza is my favorite food, but pizza is not just pizza. It is a complicated combination of few essential things…the crust, the sauce, the cheese and the topping, number one being the crust! 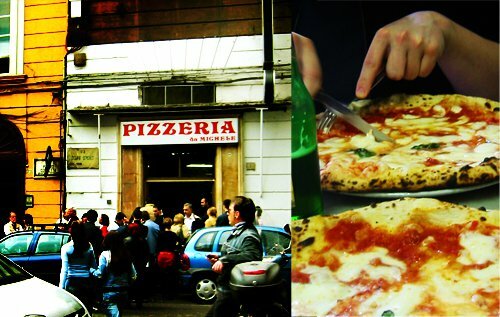 I even went on a trip to Napoli for few days just to eat pizza (and little bit of pasta). But I recommend you watch Heston and his episode about the search for the perfect pizza. There you can see what I am talking about, it´s a great episode for pizza lovers. Making the dough. 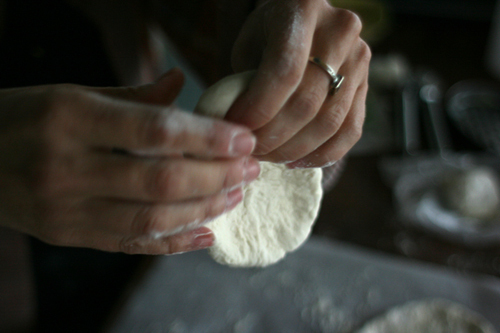 A good flour is what you need, usually pizza enthusiasts talk about 00 flour. I bought a good flour, called Marino, organic from Italy, not 00 though but it´s really good. 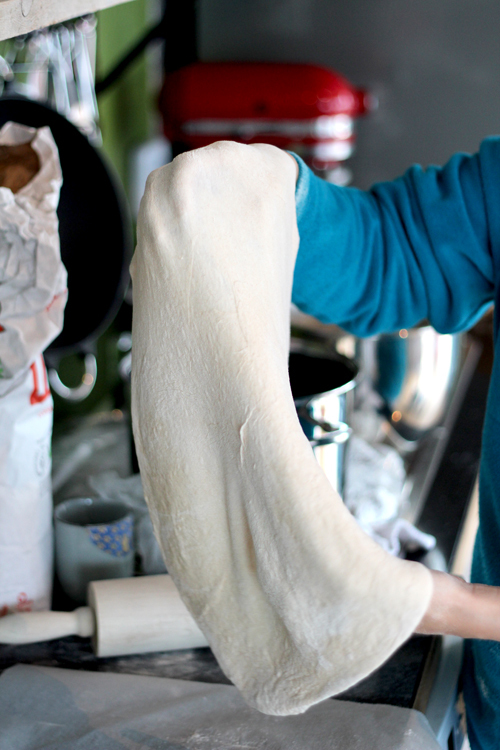 It´s a “Burrato”, that is it´s soft and Ideal for bread and pizza. Put all ingredients in a mixer, like a KitchenAid and use the hook. Let the machine run for at least 5 minutes on a medium speed. It is important to kneed the dough in the machine for 5 or 10 minutes. (By hand I would either do a lot or kneed it for very short time, half a minute or so). Rolling it out. In stead of rolling, pinch it. Heston talked about pinching the dough with your finger tips until you have a round large enough crust. You could do both, roll and pinch, and see if you find any difference. Thin or thick? For me it´s thin. The thinner the better. If you like it thicker and more like bread, roll it out for about 1/2 cm thick and bake it at lower temp, 200°c for 10-15 minutes. Baking. The key is to bake the thin crust pizza for as short time as possible. There for, you need to have the oven as hot as possible. 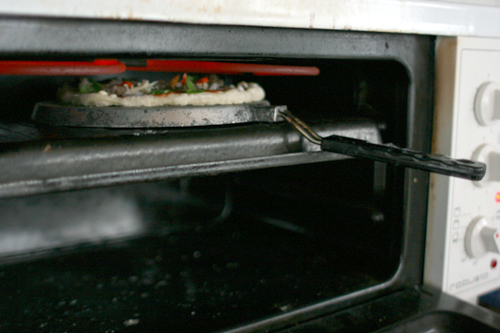 Most ovens go up to 250°c. Mine goes to 300°c. Heat your oven on as high as possible. Heat it for at least 30 minutes. Get a pan, cast iron or steal. ( I used an Icelandic pancake pan). Put the pan on a hot stove for 20 minutes before you put the pizza on it and in the oven. If the pan has a handle that doesn´t fit in the oven just keep the door open a bit. After 30 minutes (or more) turn your oven on top grill, the heat as high as possible. (my oven has 3 settings for grill temperature . Put the “rolled” (or pinched out instead of rolled out, as seen on Heston´s episode) out pizza dough on the bottom of the pan, (you turn the pan up side down) then sauce, toppings and cheese. Put it back in the oven for as long as it takes to bake it. Watch it carefully so you don´t burn it, it´s probably about 3-5 minutes. I´ve done pizza so often I usually don´t measure, I just throw in a teaspoon of sugar, salt and 2 teaspoons of yeast and then what ever looks like enough of flour and water until I get the consistency I like. Heston uses pre fermented dough. I also find the dough be good after keeping it in the fridge for few days. 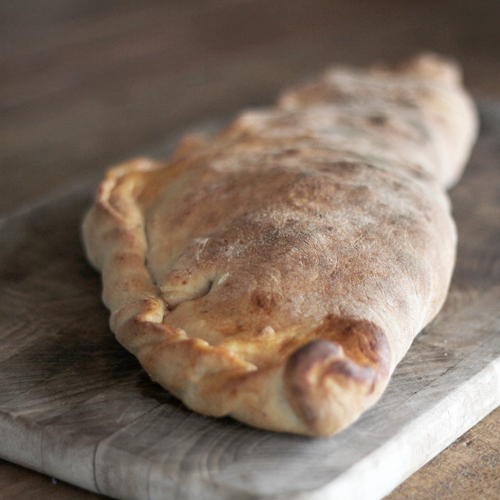 Here is a good recipe, very basic and ready in an hour or so. Mix all ingredients in a mixer with the hook for 5 – 10 minutes, you want the dough to be on the stickier side. Add more water if needed (or less). Let rise for an hour in a warm place, the bowl covered with a plastic wrap. 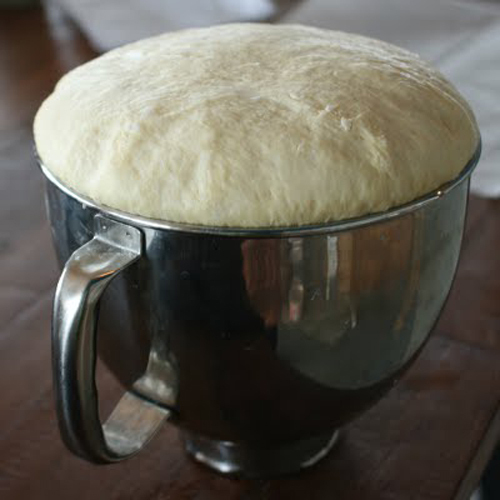 This is a well risen dough, probably from about a 1 kg of flour. Take the dough and add more flour, couple of tablespoons, to kneed it a bit more by hand just until you have a good stick free dough. Roll or pinch it out as thick or thin as you like. Here is a link to Heston´s recipe. I haven´t tried it yet, but this weekend I will, I ´ll let you know how it goes. Next time, let´s talk about the sauce.